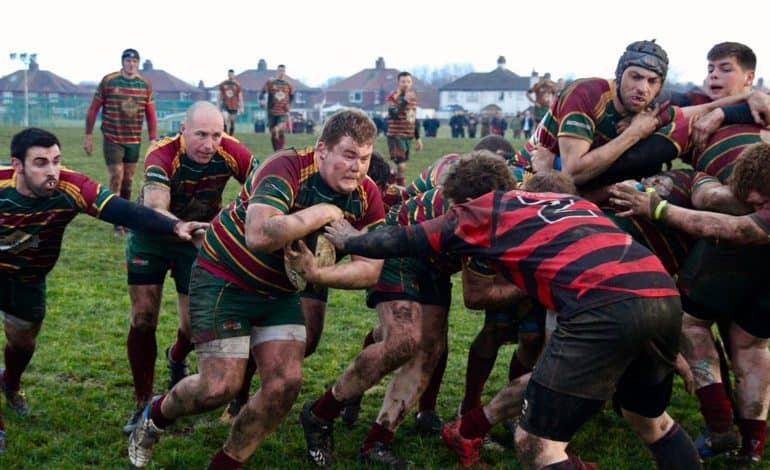 Newton Aycliffe’s first XV travelled to local rivals and established Durham and Northumberland 2 team, Sedgefield. Both teams have had a bad run of recent form, and both sides wanted the win. Aycliffe took to the field with a strong squad with only a few changes from last week’s side which face Whitley Bay Rockliffe. The game started poorly for the First XV, with Sedgfield immediately applying pressure from the kick off, and camping in the visitors twenty two, pressure which told on three minutes as the visitors ceded a penalty which the home side duly converted into three points. From the restart Sedgefield reapplied the pressure, carrying hard into the ten channel before spinning the ball wide to exploit the overlap on seven minutes, converted to take them into a double figure lead. The following period saw neither side look particularly like making any ground beyond the opposition twenty two, a penalty for in at the side gave Sedgefield chance to add another three points to the tally, which their kicker duly did, taking them 13 points ahead. But it proved unlucky for some, as this score seemed to finally jog Aycliffe into gear. A good chase on the restart saw it reclaimed by the visitors, who quickly worked the hands and created an overlap out wide, which wing Harry Evans spotted, and hit from deep to outpace the Sedgefield back three, crossing for his first First XV try, converted by Adam Gascoigne to bring the visitors back into the game. It was the home side who struck next, with their ten constantly popping up to hard running forwards on his inside shoulder, and once the defence had overcommitted, working the ball wide and giving the winger time to make it over. The open play was going the way of the home side, however the set piece was entirely dominated by the visitors, with complete dominance in both lineout and scrummage. It was from one such scrum that Aycliffe struck again as eightman James Thacker picked and went from the back of an inexorably forward going scrum, beat the flankers and dived over, again bringing the visitors back to within a converted try. Both sides came out of the shed firing, however overexuberant defence saw the visitors infringe, and gave the home side an easy three points. The next fifteen minutes saw both sides fighting for possession, both literally and metaphorically, as a scuffle saw both teams going in, and two players from each side going off for ten minutes. This heated period was followed by the home side again drawing the visiting defence in before going wide to work an overlap and cross again, taking Sedgefield well clear. Ten minutes later, and following a well-matched period in which neither side looked like crossing, the home side struck again, this time profiting from poor defence to go over under the sticks. However, it was the visitors who would have the final say, and on eighty minutes, Luke Tinkler through the dummy before hitting the defenders inside shoulder, breaking the tackle and crossing to give the visitors something. The conversion was taken in a somewhat unorthodox style, as Adam Gascoigne capped off what was a good personal performance with a dropkick conversion from wide out. This result sees Aycliffe remain second bottom, however as demotion rivals Richmond also did not win, there still is hope that the First XV will manage to stay up in DN2.